Here it is! 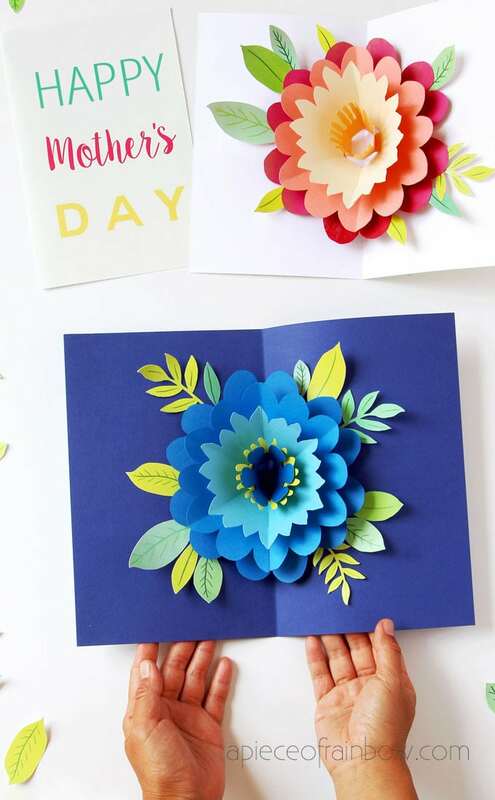 This handmade Happy Mother’s Day card is FAIL- PROOF even for beginners. I tested it five times ( really ), some cards were cut by hand, some using my favorite crafting machine: the Cricut Maker. Every one of them popped up easily. 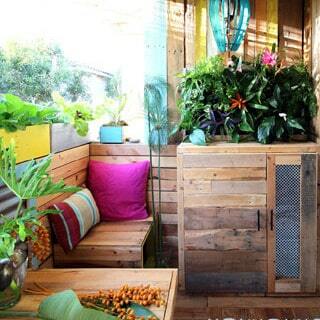 So yes, you can make it easily! 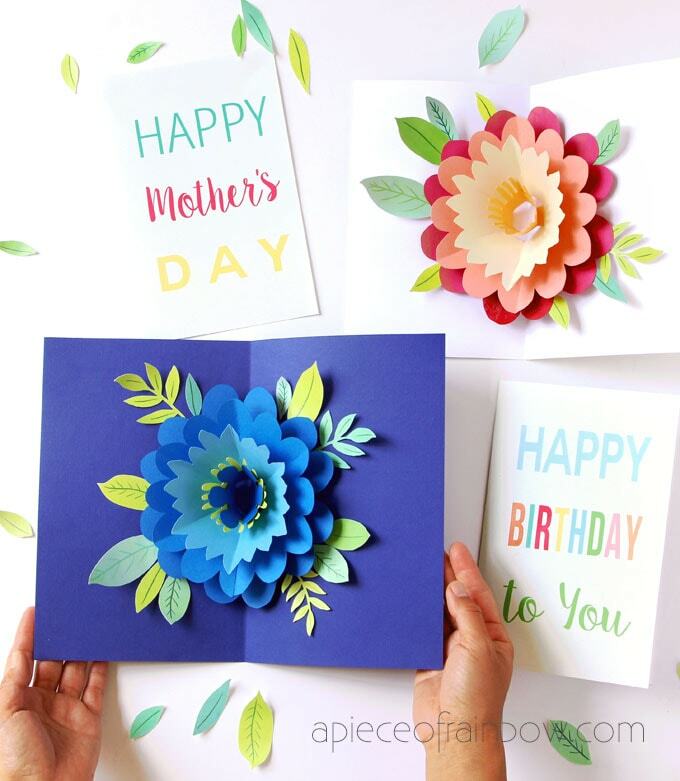 I will share with you all the free printable leaves and flowers templates, SVG files, and step by step tutorial with a video on how to make a beautiful DIY Mother’s Day card with a big pop up flower, on your Cricut smart cutting machine or by hand. 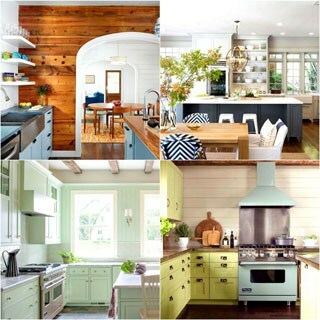 I will also share a couple of color and design variations. If you have a Cricut Maker or Explore, I have a special treat for you. 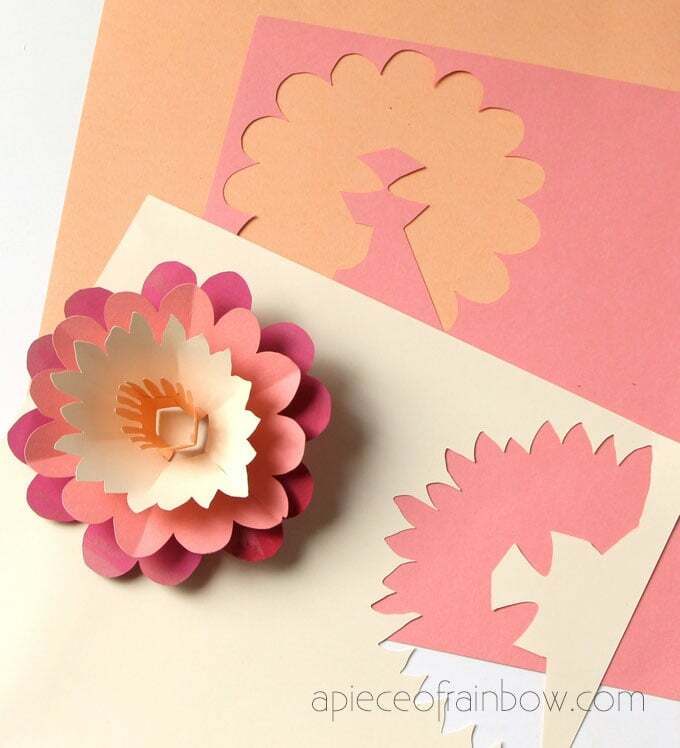 Have you tried the amazing Cricut print then cut feature? 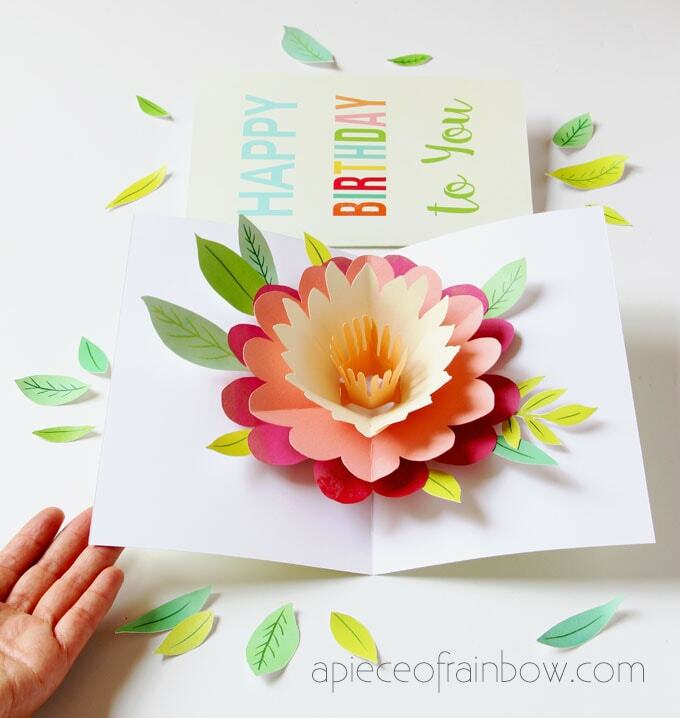 You won’t believe how easy it is to cut these hand-drawn leaves I made for the card using this amazing feature. As a first timer, I am able to learn and use it in less than 5 minutes! Card stock: Cricut.com has really beautiful quality card stock. I use a pack of mixed blue card stock for the blue flower card, and a pack of pink and ivory card stock for the pink flower card . You can use this white card stock to print the covers and the hand drawn leaves. 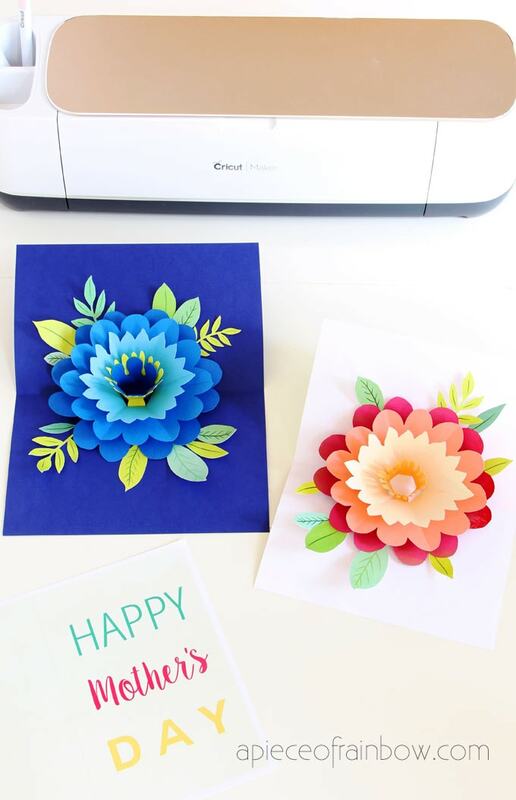 there are two ways to cut everything: you can use scissors or an Xacto knife to cut, but if you are a DIY and crafts addict like me, a Cricut Maker ( or Cricut Explore ) is such a joy to use! 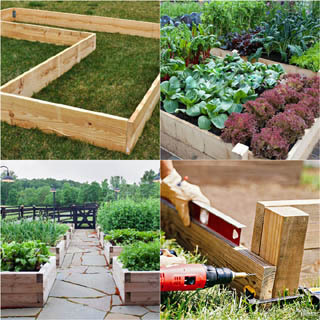 The smart machine can cut so many materials in no time. 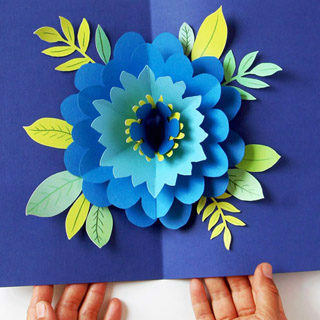 You can make a gorgeous flower using as few as 3 to 4 flower layers, or use all 5 layers. 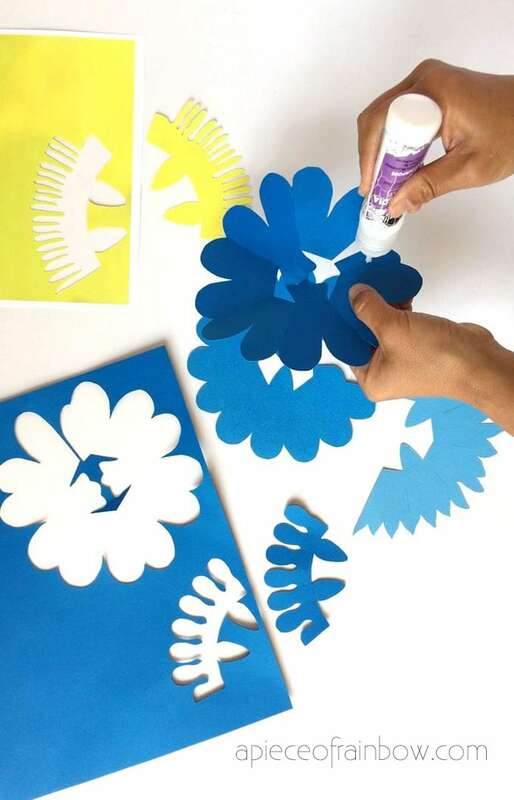 If you are cutting everything by hand, tape the flower templates ( free download at the end) to the card stock using double sided tape, and cut using scissors or an Xacto knife. The Cricut Maker is my favorite little helper on so many crafts and decor projects. I am sharing the SVG file at the end for you to use. Here’s a detailed tutorial on getting started with your first Cricut Maker project in 20 minutes! 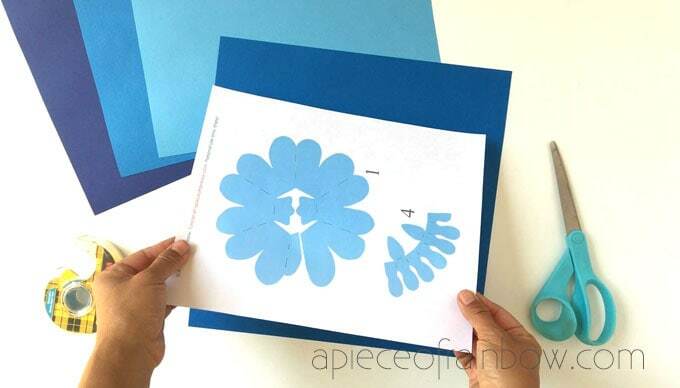 To cut the flowers, just upload the SVG flower file in Cricut Design Space, double check and make sure the largest flower measures about 6″ to 6.5″, and keep the group of flowers together when you resize. 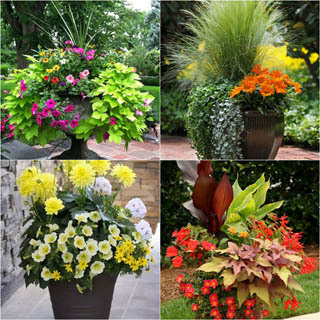 Tip: after resizing, un-group, and select each flower shape with the cut lines on it, and click “attach”. 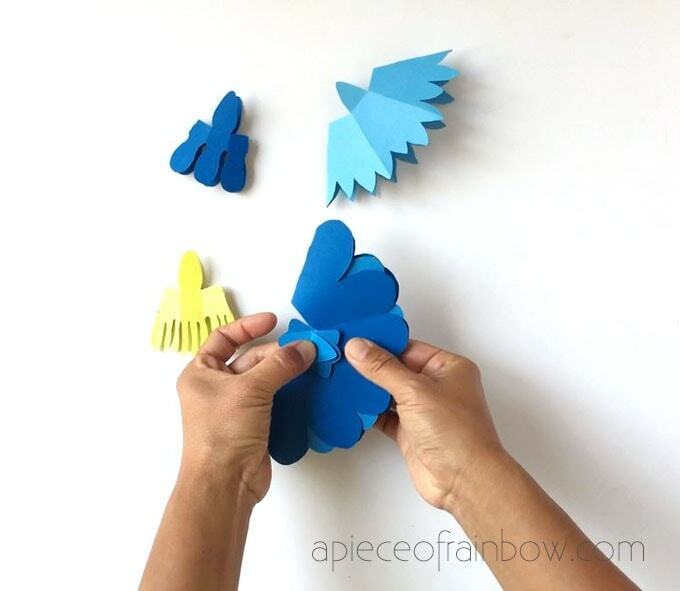 The attach function helps to hold all your cuts in the same position within each flower shape. 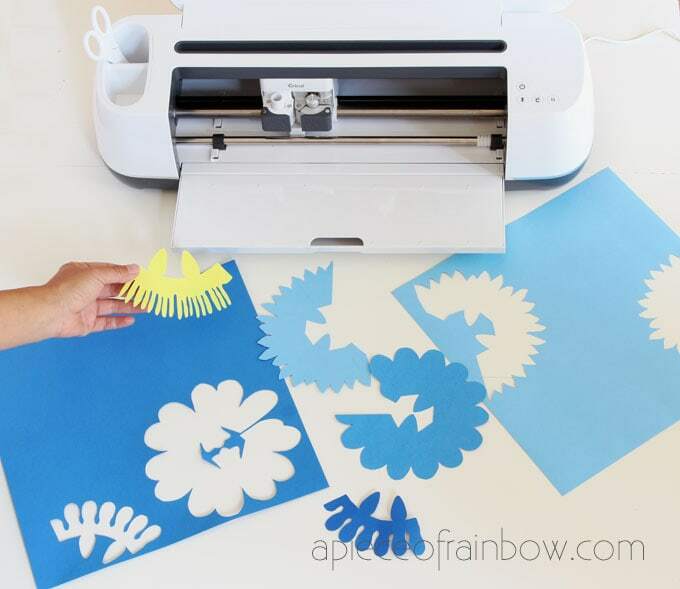 The Cricut Maker will group the same colors on a cutting mat, and prompt you to change mat when cutting the next sheet of color card stock. Now the super fun part: print then cut! I couldn’t believe how easy it was. The key is to use a png or pdf file which has transparent background. I made this sheet of hand drawn leaves as a png file you can download. When you upload it in Cricut Design space, it will ask you to choose whether it’s print then cut, or cut only. 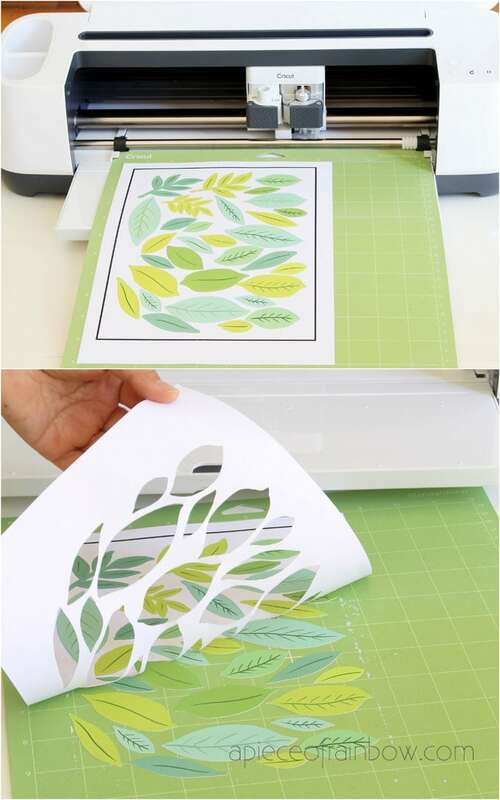 Selecting print then cut will tell the machine to print the entire image, and cut along the outlines of each leaf on the transparent background. First the machine will send the png file to your printer, and it will print out like this: the black lines are registration marks, and each leaf has a little bleed around the edges, this ensures that each leaf is cut precisely to the right size without any white paper left on the edges. So smart! Keep in mind that currently the maximum image size for Cricut Print Then Cut is 9.25″ x 6.75″ and the default material to print is 8.5″ x 11″. The key to this step is to carefully match the tabs on each layer, and use just a dot of glue on each tab. 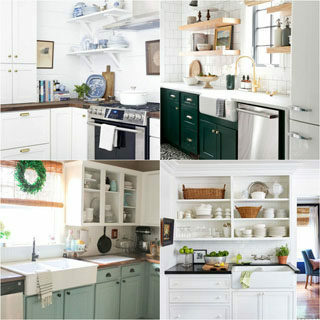 I will show detailed photos. 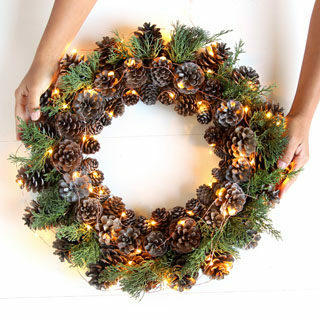 You can also watch the video tutorial below to follow along. Fold flower #1 in half, matching the two tabs, fold in between the petals along the cut lines, glue the two end petals together. Repeat with the other flower layers. Place flower layer #2 inside layer #1, fold the tabs of each layer so the folding line matches. Glue the tabs of flower layer #1 to layer #1. Repeat with flower layers #3. IMPORTANT: When it comes to the center layers #4A and #4B, instead of trying to match the folding lines, match the tip of each tab. Once all the layers are glued together on these tabs, put a dot of glue between the back of the tabs on layer #1 and the back of layer #1 petals, and press together. This will help the flower open to full size. Step 3: assemble Happy Mother’s Day card with pop up flower. 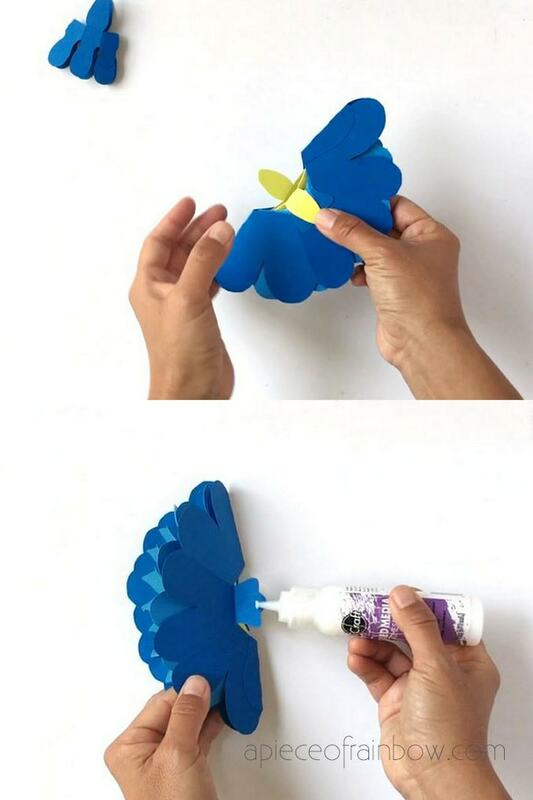 There are different ways to use the cover for our DIY Happy Mother’s Day card with pop up flower. You can print it out on this white card stock ( like in the pink flower version), or use it with colored card stock to create a layered look (like in the pink flower version). I love the blue flower on the deep blue background, so I trimmed Happy Mother’s Day card cover, and glued it to the deep blue card stock also trimmed to about 9″x11″, and folded in half. Center the stack of flowers vertically inside the card, and line it up with the folded line. 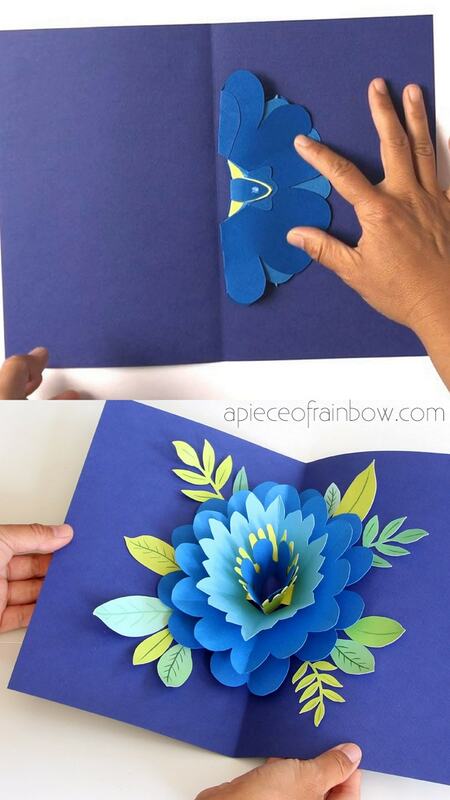 Put a dot of glue on the back of the tabs and press together the cover and the flower tab. Do this on the front and back cover. Check out the video above if you are unsure of this step. Add some leaves as final touches. 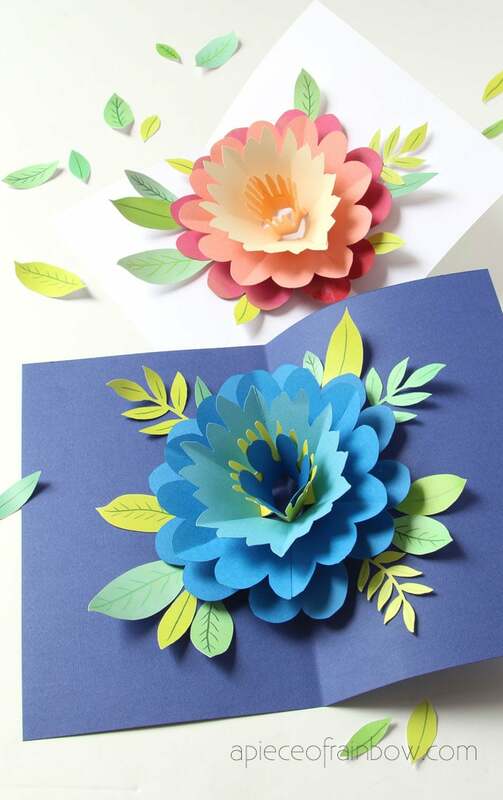 You can glue the leaves to the card or to the back of the flower. It is so much fun playing with these pop up cards. 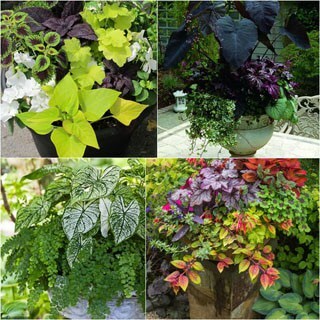 Don’t you think they would make beautiful displays on a shelf or mantel? To download all free templates for this card and tons of other goodies, click button below! Want more Cricut project? 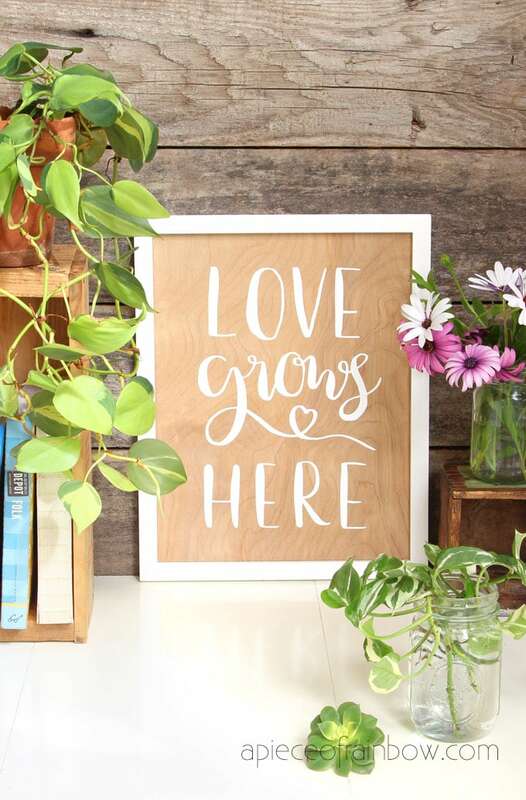 Here’s a set of DIY wood wall art with hand lettered quotes you can make in an hour! 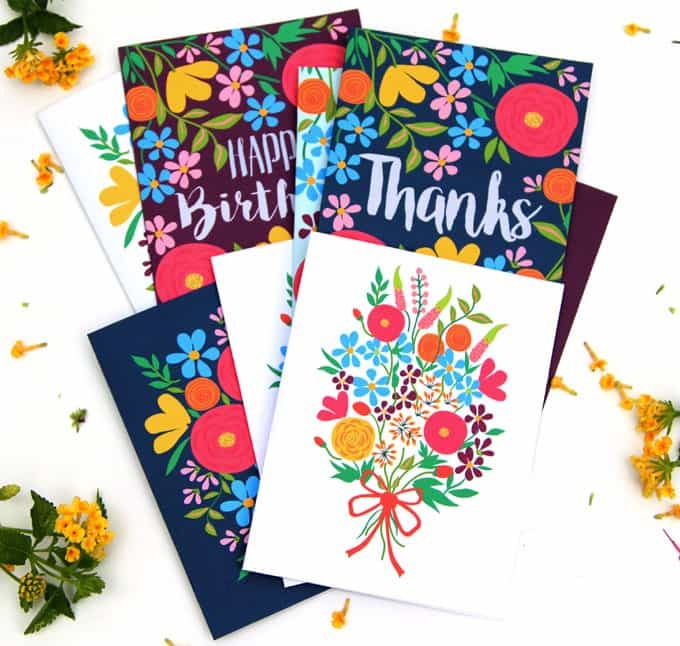 You may also love: A huge set of free printable floral greeting cards! 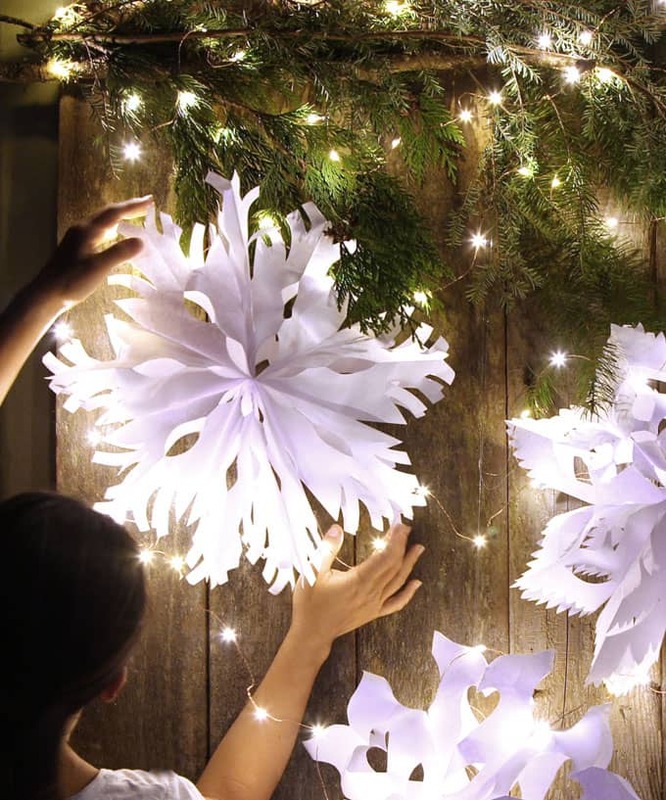 Another 3D paper craft to make: DIY giant 3D paper snow flake pendant. Previous Post: « Why Haven’t I Thought of this Insanely Easy and Beautiful Glass Jars DIY? These cards are so cute! I love that they are doable without a Cricut, too, since I don’t have one. I have thought about it, it wouldn’t be so great for the current budget, but I know I would end up having so much fun making all the things, so maybe this year I will get one! What a beautiful card! I have wanted a Cricut for years now — and I had never even thought about doing this type of craft with it. My older daughter would absolutely love creating a card like this. 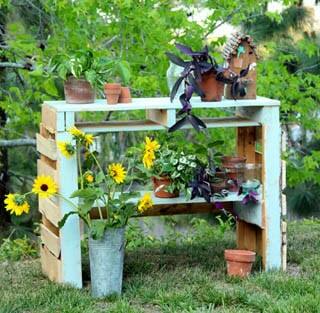 Thank you for sharing such a beautiful idea! Those cards are just gorgeous – so beautiful!!! 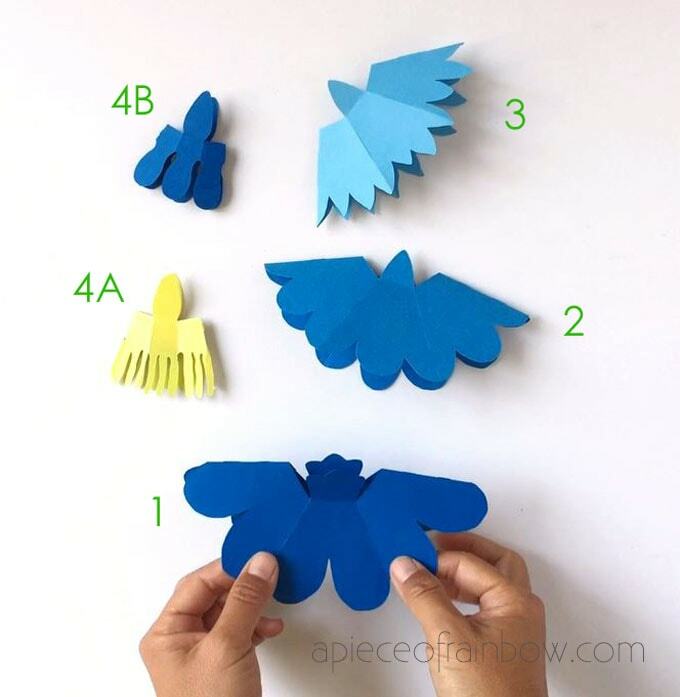 My SIL has a Cricut and would love this activity! These cards are so beautiful! 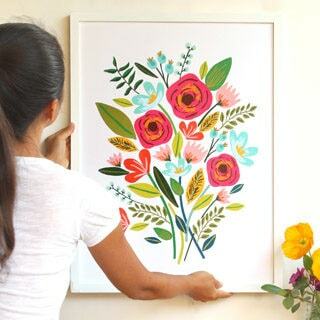 I have not convinced my husband that our home needs a cricut yet, but my sister in law has one, so I may have to go over to her house and make one of these for my mom! Oh wow this turned out so cute!! 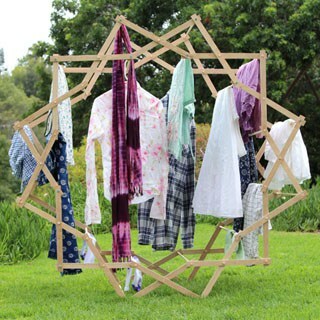 I need to bust out my machine and make some with my kids! Oh, wow. It looks so sweet. These cards are so beautiful. We with my son will do it for my mom. Oh. 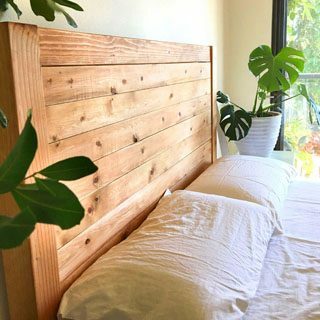 Thank you for sharing with this diy. :)) Good luck with your blog! Amanda, I’ve been signed up to receive the newsletter for a while. I hit free downloads in the newsletter, and still can’t do it! I went back & forth multiple times. Can you please help me? hi karan, do you get to a page with all the downloads when you hit the button in newsletter? Hi Ananda, I have all my things lined up and this is only the third project with my Cricut. The leaves printed and cut beautifully. I was able to upload all the png files, but the svg file only has the yellow piece 4b showing – none of the other flower parts. Can I just resize all the png files to the same size and work with that? thank you! This is such a gorgeous project.